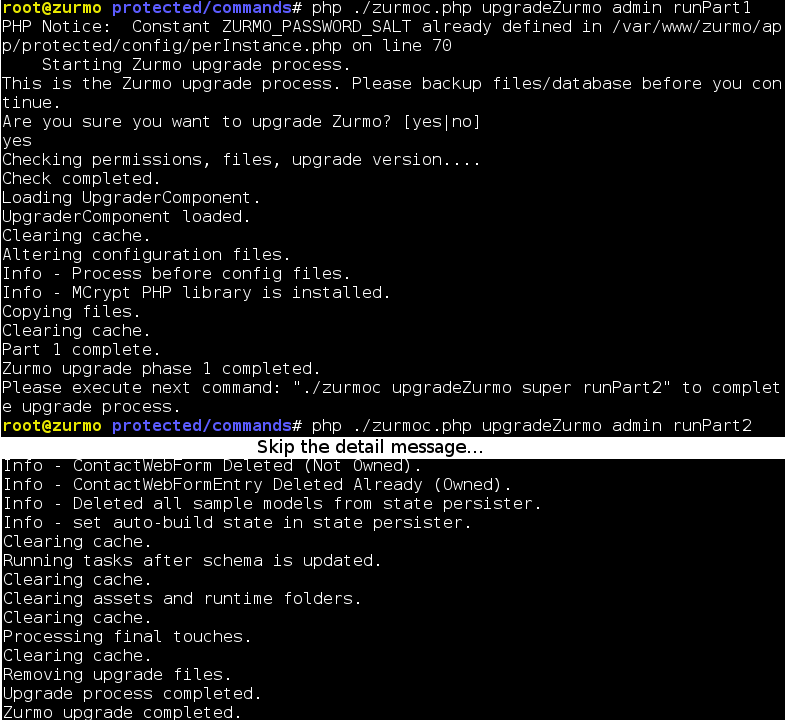 Zurmo does provide an upgrade documentation but it is for Windows. If you look into the zurmoc command in folder /app/protected/commands/, you will see a zurmoc.bat. It doesn’t work for Linux. Here I am going to show you how to upgrade ZurmoCRM in TurnKey VM. It works for Linux, too. I use FileZilla to upload to VM. You may see ftp information after TurnKey boot up and prompt for TurnKey Linux Configuration Console. You need to put the IP in host, choose “SFTP” as protocol, and use root account to login. Please create a new folder and rename to upgrade in /var/www/zurmo/app/protected/runtime. Then upload upgrade first file ZurmoUpgrade_1.5.14-2.0.22.zip to this new folder. You cannot upgrade while more than one zip files in upgrade folder. Upgrade files to TurnKey with FileZilla. ZurmoCRM upgrade commands and process messages. Repeat above steps to upgrade from 2.0.22 to 2.2.3. Remember to remove ZurmoUpgrade_1.5.14-2.0.22.zip before upload ZurmoUpgrade_2.0.22-2.2.3.zip. Don’t leave two zip files in upgrade folder at the same time.